I was doomed the first time I saw them at the supermarket - Meyer lemons, six to a bag, and as fresh as any lemon could be in northwest Indiana in March. I had a Meyer lemon plant for several years, and it produced approximately two lemons before it died. Now I could have them without the pain of trying to grow them. Just one of the best things about the Meyer lemon is its story (on NPR by Julie O'Hara). The Meyer lemon was named after the explorer who brought it from China to the U.S. Frank Meyer, who worked for the USDA, brought back a sample of the plant in 1908. Although its exact parentage is uncertain, it's thought to be a cross between a lemon and either an orange or a mandarin. Its claim to fame is its lack of acidity common to most lemons. 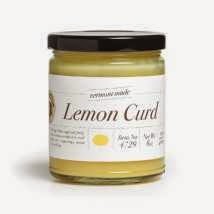 With its very thin skin, smooth in texture unlike regular lemons, it doesn't ship well, so it's just now starting to find its way into supermarkets outside the citrus belt. How appropriate it is that I received my first Microplane zester around the time I fell in love with lemons of all kinds, Meyers in particular. I'd been using the fine side of a four-sided cheese grater to zest lemons, always disappointed in the clumps of stuck together zest I ended up with. 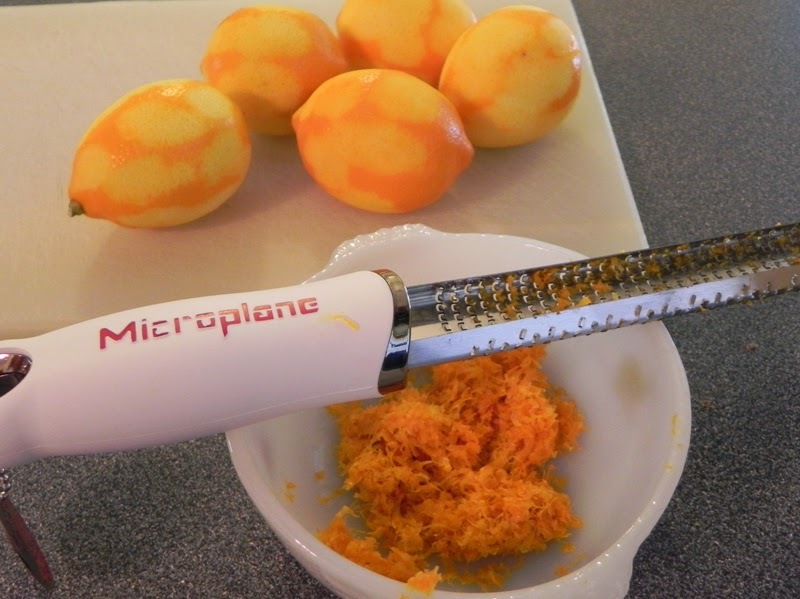 I had so much fun with my Microplane, I ended up zesting six Meyer lemons! I put it into small glass jars for freezing and, even frozen, I can easily scoop out a bit at a time. I added about a tablespoon of the zest to an 8 oz. package of cream cheese and a cup of powdered sugar to make icing for the cupcakes. 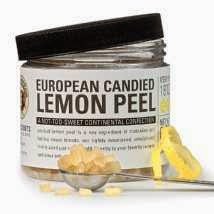 I used a plain vanilla cupcake recipe but added some European candied lemon peel to it (about 1/4 cup), which gives it some nut-like bites with a mild lemon flavor. I cored the cupcakes and filled them with King Arthur Flour Lemon Curd, a creamy, custard-like product with a mild lemon taste. The cupcakes aren't sit-up-and-take-notice lemony, but they are definitely lemon. I think they'll be great for Easter brunch.